Yangon is a truly lovely place to begin your travels. Spend time immersing yourself in the tapestry of cultures that live along the banks of the grand waterway, Inle Lake. Get in touch with your spiritual side in the ancient capital of Sagaing. Bagan will take your breath away with the sheer scope of its temple complexes and spending time amongst them is a moment you’ll always treasure. Welcome to Myanmar and your ovenight stay in Yangon. Enjoy your welcome dinner at the beautiful Le Planteur Restaurant. Fly to Heho and drive to Nyaung Shwe. After lunch, glide across Inle Lake in private long tail boats towards your resort for a three night Special Stay. Take an excursion by long tail boats to visit Inle Lake’s floating market, which moves every five days. See the holiest site in Inle Lake, the Phaung Daw Oo Pagoda and Royal barges. Learn all about traditional Intha cooking with a visit to an Intha family home for lunch. Later, cruise down a network of small canals to the Pa-Oh village of Indein. Visit Pindaya Caves or travel to Taunggyi and lunch at a local winery. Alternatively, take a local village trek close by. Enjoy evening drinks while overlooking the stunning lake. Fly to Mandalay. Later, head to Mandalay Hill for magnificent sunset views before your overnight stay. Disembark and fly to Yangon and take lunch at the House of Memories Restaurant. Then settle into your Pacific Club floor room at the Pan Pacific Yangon for a two night Special Stay. This evening enjoy the included amenities of your Pacific Club access. 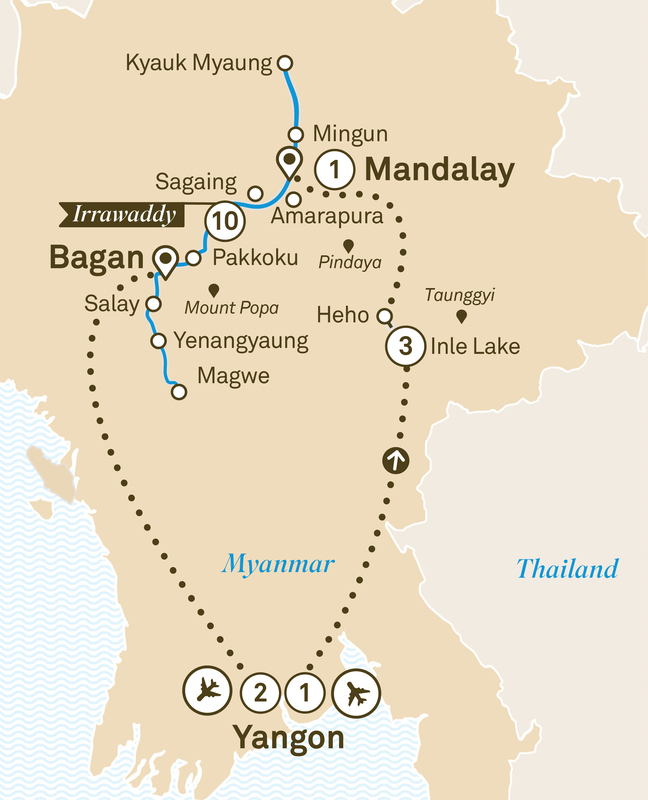 Say 'Thaw Dau Mal' to Myanmar.